Tamika Mkandawire scored a controversial goal as Millwall beat League Two Morecambe in the Carling Cup second round. Morecambe players were expecting the home side to put the ball out of play when Millwall's John Marquis lay injured in the box. But Mkandawire carried on to make it 2-0 on the stroke of half-time. Hamer Bouazza put the Lions ahead with a stunning 30-yard freekick. Morecambe had dumped Barnsley out in the previous round in a 2-0 success at Oakwell and arrived in the capital on the back of three successive league wins. But they never really threatened to pull off a repeat. The Shrimps did go close inside the second minute when striker Danny Carlton hit an 18-yard shot which flashed narrowly wide - but then the home side took control. Bouazza's shot from 12 yards was well saved from visiting goalkeeper Barry Roche, and Josh McQuoid also went close from a corner. Bouazza did find the target though on 34 minutes, sending a superb left-footed free-kick into the top corner from 25 yards. The second goal arrived - controversially - in first-half stoppage time. Chris Hackett found Mkandawire with a fine pass and the Lions midfielder hit a right-footed shot into the net from 20 yards despite his own player - John Marquis lying injured in the box. Morecambe players had expected Millwall to put the ball out of play so Marquis could be treated. Roche kept the score down after the break with several stops, most notably from McQuoid, as the Lions held on with relative comfort. 90:00+4:09 The referee signals the end of the game. 90:00+3:47 Phil Jevons has an effort at goal from close range which goes wide of the left-hand upright. 90:00+3:13 Lewis Alessandra takes a shot. Save made by Steve Mildenhall. Short corner taken by Dan Parkinson from the left by-line. 90:00+2:04 Phil Jevons takes a shot. Save by Steve Mildenhall. 90:00+0:37 Free kick awarded for a foul by James Henry on Laurence Wilson. Laurence Wilson sends in a cross, Phil Jevons produces a header from close range which goes wide of the left-hand post. 88:10 Lewis Alessandra takes a shot. Darren Ward gets a block in. 84:24 The ball is sent over by Laurence Wilson, Will Haining produces a right-footed shot from close in which goes wide of the right-hand upright. 84:24 Booking The referee shows John Marquis a yellow card. 84:13 Laurence Wilson fouled by John Marquis, the ref awards a free kick. 82:53 The assistant referee flags for offside against John Marquis. Will Haining restarts play with the free kick. 79:31 The assistant referee signals for offside against Phil Jevons. Indirect free kick taken by Steve Mildenhall. 79:09 The assistant referee signals for offside against John Marquis. Will Haining takes the free kick. 78:31 Substitution Scott Barron comes on in place of Hamer Bouazza. 78:03 Josh McQuoid takes a shot from just inside the penalty box which clears the crossbar. 76:24 James Henry gives away a free kick for an unfair challenge on Stewart Drummond. Direct free kick taken by Stewart Drummond. Foul by Tamika Mkandawire on Izak Reid, free kick awarded. Direct free kick taken by Stewart Drummond. 71:33 Substitution Kevin Ellison leaves the field to be replaced by Dan Parkinson. 71:33 Substitution Phil Jevons joins the action as a substitute, replacing Danny Carlton. 71:33 Substitution (Morecambe) makes a substitution, with Stewart Drummond coming on for Garry Hunter. 71:33 Effort from inside the area by Garry Hunter misses to the left of the goal. 71:18 The ball is swung over by Laurence Wilson. 67:47 Danny Carlton takes a shot. Save by Steve Mildenhall. 67:18 Alan Dunne sends in a cross, Barry Roche makes a save. 65:46 Danny Carlton is caught offside. Steve Mildenhall takes the indirect free kick. 64:26 Izak Reid takes a shot from deep inside the box clearing the bar. 62:48 Izak Reid produces a left-footed shot from outside the penalty box and misses wide left of the target. 62:31 The ball is crossed by Josh McQuoid, Andy Parrish manages to make a clearance. 61:25 The referee blows for offside. Free kick taken by Barry Roche. 59:15 Kevin Ellison produces a left-footed shot from the edge of the box and misses to the left of the target. 57:39 The assistant referee signals for offside against Danny Carlton. Alan Dunne takes the free kick. 55:52 Hamer Bouazza takes a shot. Save made by Barry Roche. Inswinging corner taken from the right by-line by James Henry. 55:28 Gary McDonald takes a shot. Blocked by Tamika Mkandawire. 49:12 Josh McQuoid takes a shot. Barry Roche makes a save. 48:33 Jordan Stewart gives away a free kick for an unfair challenge on Andy Parrish. Laurence Wilson crosses the ball from the free kick left-footed from right wing, clearance by John Marquis. 48:18 Izak Reid produces a cross, Tony Craig makes a clearance. 45:01 Substitution James Henry joins the action as a substitute, replacing Chris Hackett. 45:00+2:59 The match has reached half-time. 45:00+1:26 Assist on the goal came from Chris Hackett. 45:00+1:26 GOAL - Tamika Mkandawire:Millwall 2 - 0 Morecambe Tamika Mkandawire fires in a goal from just outside the penalty area to the bottom left corner of the goal. 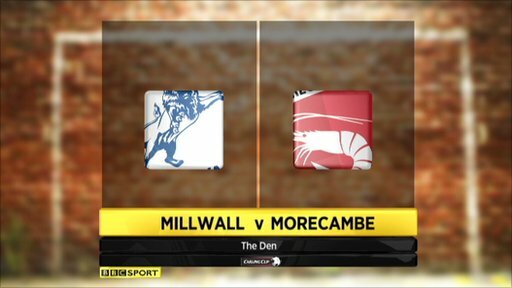 Millwall 2-0 Morecambe. 45:00 The ball is sent over by Jordan Stewart. 42:41 Chris Hackett takes a shot. Blocked by Andy Parrish. Corner taken left-footed by Hamer Bouazza, clearance made by Kieran Charnock. 40:25 Unfair challenge on Kieran Charnock by John Marquis results in a free kick. Barry Roche takes the free kick. 38:27 Corner from the left by-line taken by Chris Hackett, Tamika Mkandawire has a headed effort at goal from close in which goes wide right of the target. 37:09 Free kick awarded for an unfair challenge on Garry Hunter by John Marquis. Direct free kick taken by Barry Roche. 35:05 Josh McQuoid takes a shot. Save by Barry Roche. 33:58 GOAL - Hamer Bouazza:Millwall 1 - 0 Morecambe Hamer Bouazza hits the back of the net with a goal direct from the free kick from long range to the top right corner of the goal. Millwall 1-0 Morecambe. 33:11 Kieran Charnock gives away a free kick for an unfair challenge on Josh McQuoid. 32:15 The referee blows for offside. Steve Mildenhall takes the free kick. 31:20 A cross is delivered by Alan Dunne, save made by Barry Roche. 30:30 Kevin Ellison gives away a free kick for an unfair challenge on Alan Dunne. Steve Mildenhall takes the free kick. 29:46 Foul by Alan Dunne on Garry Hunter, free kick awarded. Direct free kick taken by Garry Hunter. 27:24 Inswinging corner taken from the right by-line by Laurence Wilson, save by Steve Mildenhall. 25:44 Alan Dunne has shot on goal from just outside the box which goes wide of the right-hand upright. 24:40 Garry Hunter takes a shot. Steve Mildenhall makes a save. 22:09 Chris Hackett crosses the ball, Josh McQuoid makes a clearance. 21:20 Danny Carlton fouled by Tony Craig, the ref awards a free kick. Laurence Wilson takes the direct free kick. 21:04 Tamika Mkandawire takes a shot. Blocked by Kieran Charnock. 19:29 Chris Hackett delivers a inswinging corner to short, Andy Parrish manages to make a clearance. 18:24 Shot by Hamer Bouazza from deep inside the penalty area misses wide to the left of the target. 17:51 Alan Dunne crosses the ball. 16:12 Foul by Alan Dunne on Lewis Alessandra, free kick awarded. Free kick taken by Will Haining. 15:24 Chris Hackett delivers the ball, Andy Parrish makes a clearance. 13:35 Foul by John Marquis on Kieran Charnock, free kick awarded. Free kick taken by Barry Roche. 12:53 Gary McDonald gives away a free kick for an unfair challenge on Tamika Mkandawire. Free kick taken by Nadjim Abdou. 12:11 John Marquis challenges Laurence Wilson unfairly and gives away a free kick. Direct free kick taken by Laurence Wilson. 10:37 Izak Reid delivers the ball, Hamer Bouazza gets a block in. Inswinging corner taken by Laurence Wilson from the right by-line, clearance made by Tamika Mkandawire. Inswinging corner taken by Garry Hunter from the left by-line played to the near post, clearance made by Jordan Stewart. 9:04 The assistant referee signals for offside against Danny Carlton. Steve Mildenhall takes the indirect free kick. 8:32 Tamika Mkandawire takes a shot. Save by Barry Roche. 6:22 The ball is swung over by Jordan Stewart, Kieran Charnock makes a clearance. 3:56 Inswinging corner taken by Chris Hackett from the left by-line, Josh McQuoid takes a shot. Barry Roche makes a save. 3:21 Hamer Bouazza delivers the ball, Barry Roche makes a save. Tony Craig takes a shot. Blocked by Will Haining. 2:40 Hamer Bouazza takes a shot. Save made by Barry Roche. 2:01 Danny Carlton produces a right-footed shot from the edge of the box and misses to the left of the goal. 1:29 Kevin Ellison is caught offside. Steve Mildenhall takes the free kick. 0:57 Corner from the right by-line taken by Laurence Wilson, Tony Craig manages to make a clearance.